You are here: Body Imaging/Michael Citrone, M.D. Attained his undergraduate degree from Washington and Jefferson College, Washington, PA. and he attained his medical degree from Uniformed Services University of the Health Sciences in Bethesda, MD. His general surgery internship and residency were completed at Tripler Army Medical Center in Honolulu, HI. He attained his fellowship distinction in body imaging from the Naval Medical Center in San Diego, CA. During his 17 years as member of the U.S. Army, Dr. Citrone held a number of positions, including 1st Brigade Surgeon, 82nd Airborne Division and Chief of Radiology and Commander of Pharmacy, Lab and X-ray 47th Combat Support Hospital during Operation Iraqi Freedom (for which he was awarded a Bronze Star). 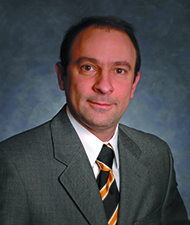 Dr. Citrone’s special interest in body imaging is focused upon musculoskeletal MRI. During his spare moments away from Boise Radiology Group, Dr. Citrone enjoys various outdoor activities, among these hunting and fishing.